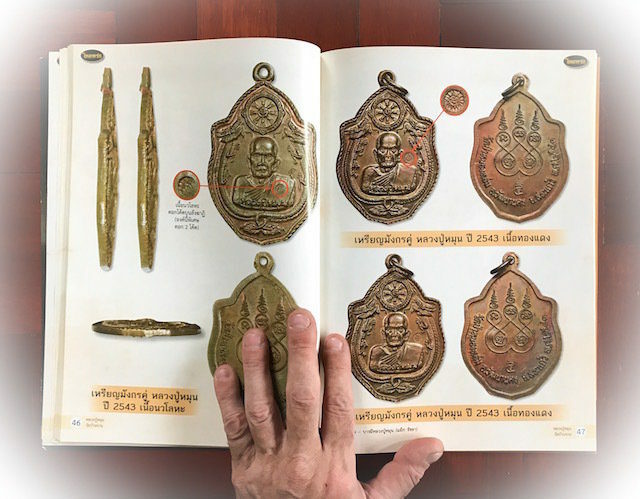 105 Years edition Jumbo size Locket Chak Fa blue version amulet, with Pra Nakprok Bai Makham Naga Throne Buddha, Ploi Sek Maha Pokasap Gemstones, 3 Takrut Sam Kasat, and Jivara Robe attached to rear face, inserted into powerful muan sarn sacred powders, from the Great Luang Phu Hmun Tidtasilo of Wat Ban Jan. 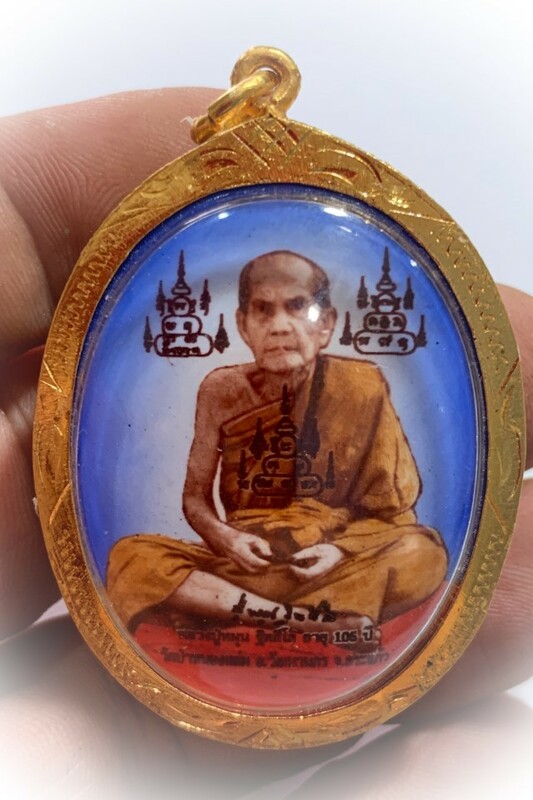 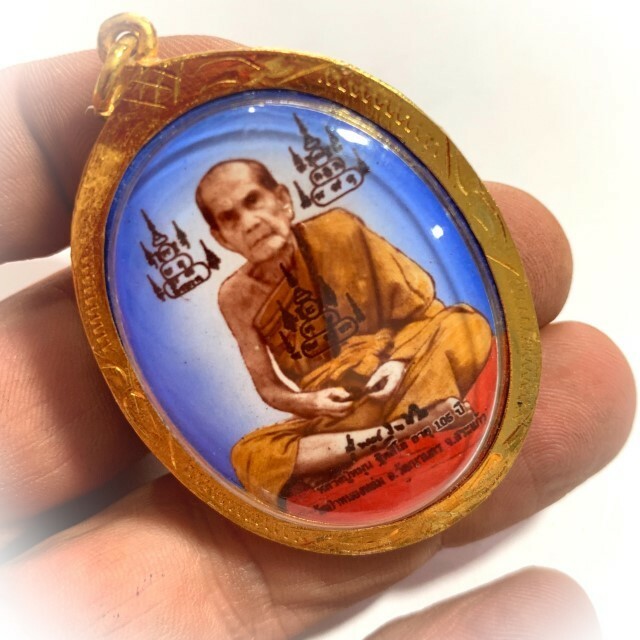 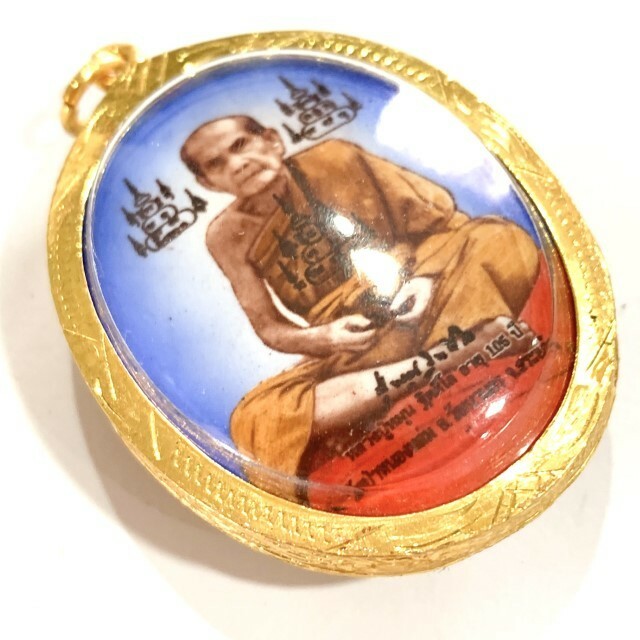 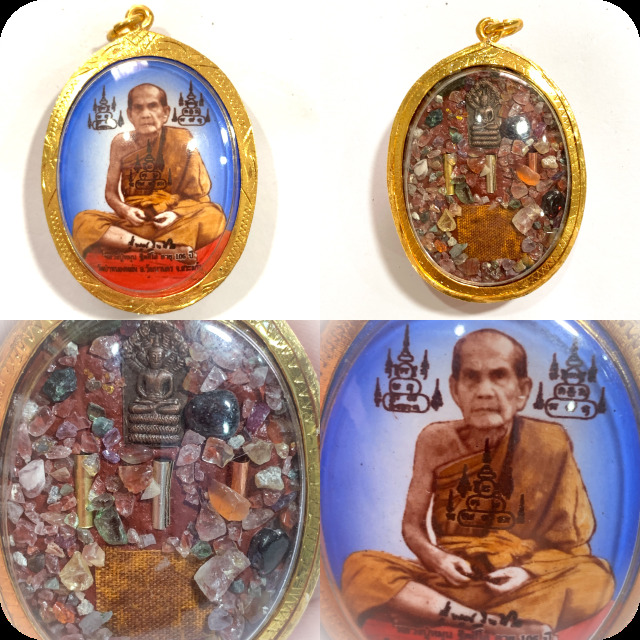 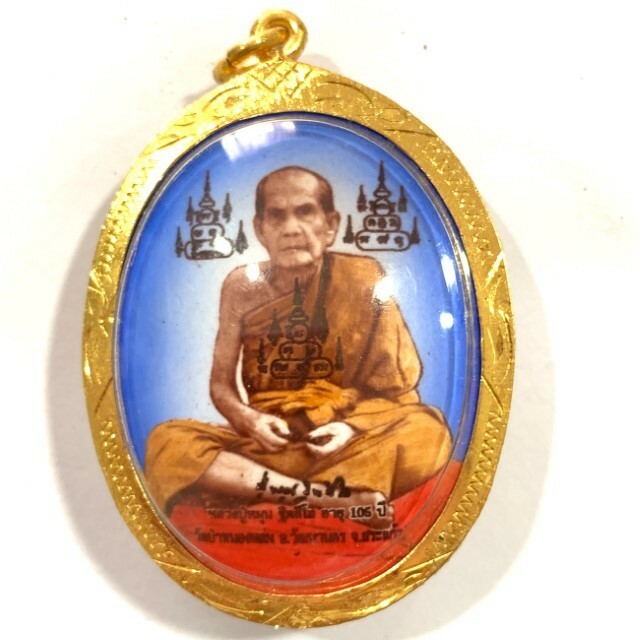 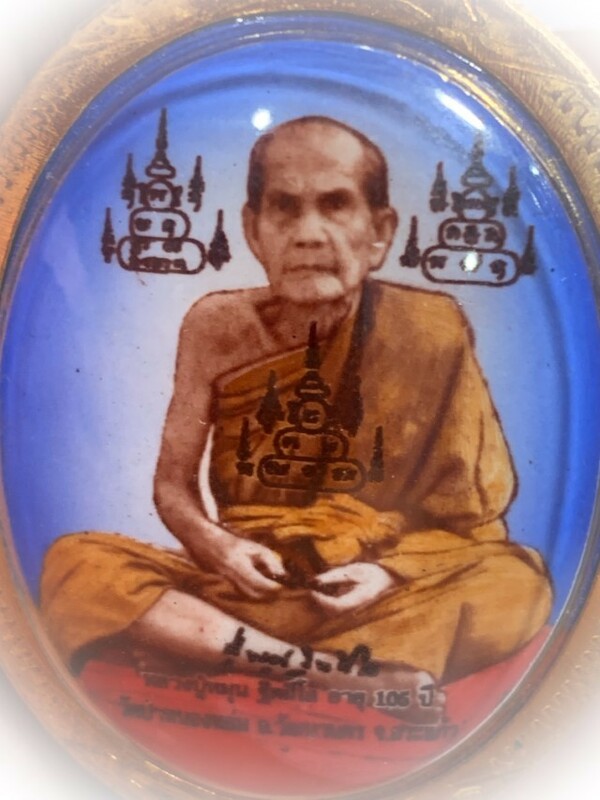 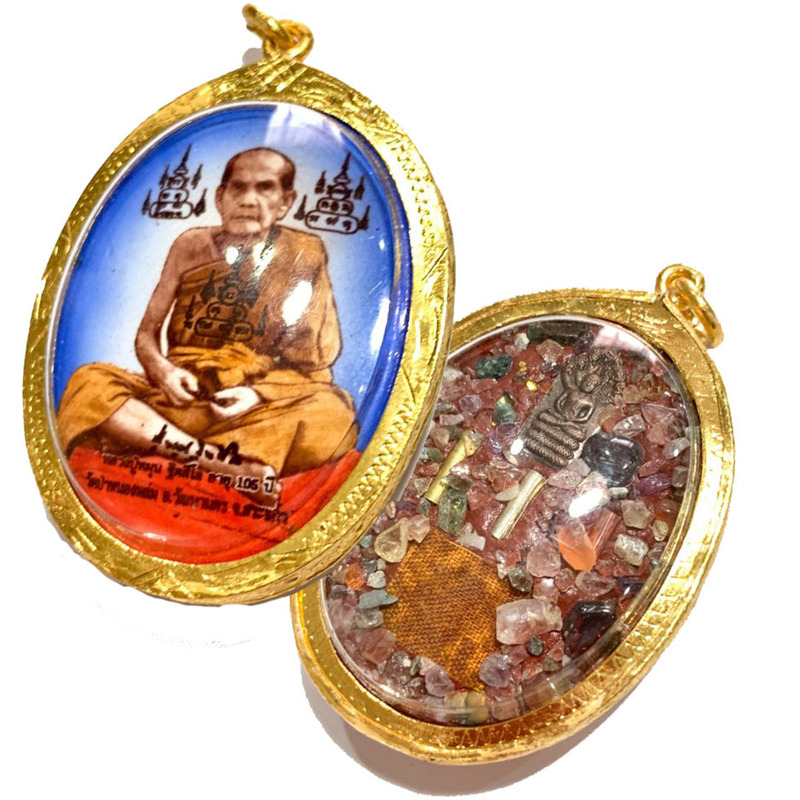 The amulets of Luang Phu Hmun are extremely popular, for they are very well known for the power of Jaroen Lap Wealth Increment, and Lucky Fortunes, as well as for their Miraculous Protective Powers. 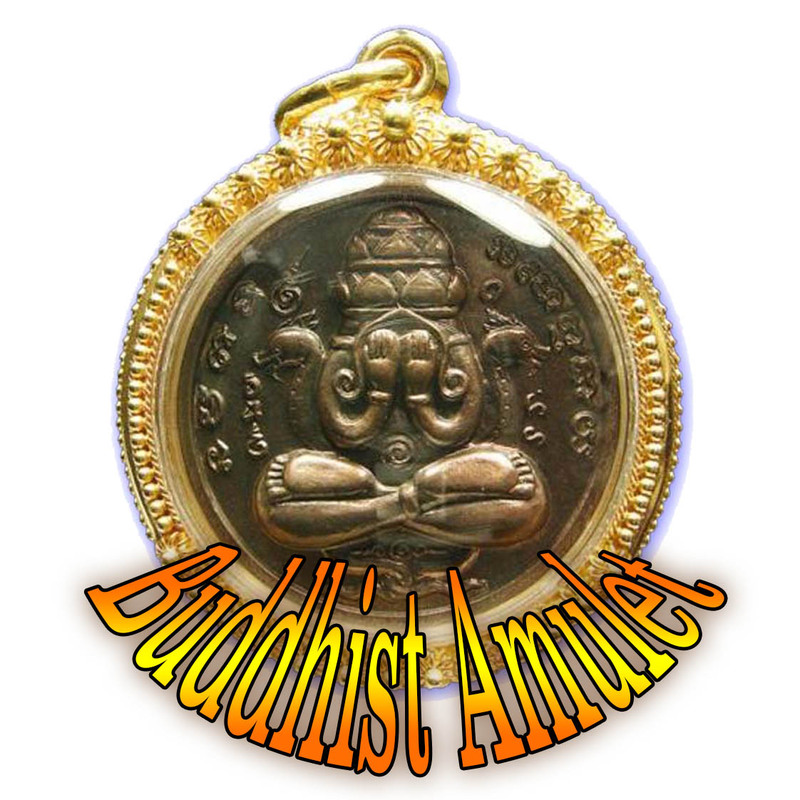 Free registered airmail shipping worldwide is offered, as is ubiquitous with all amulets in Ancient Amulet Store. 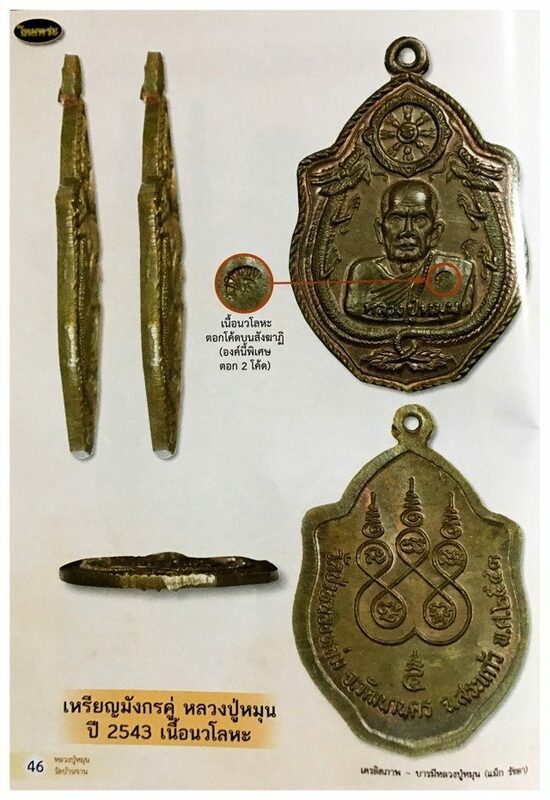 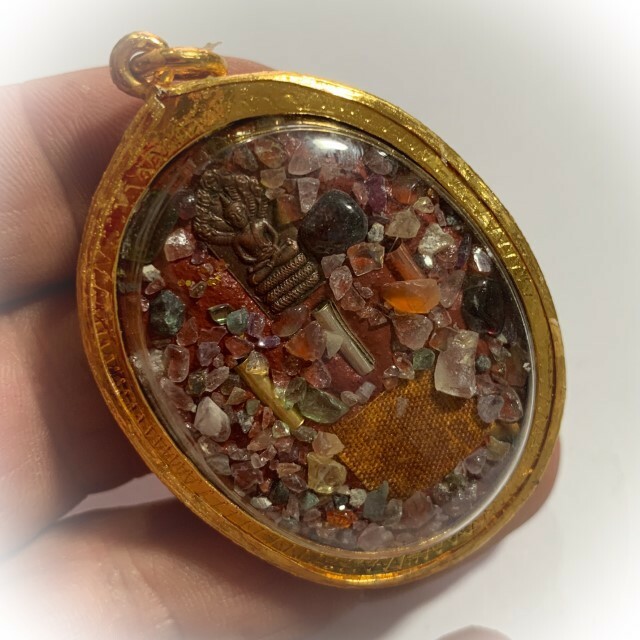 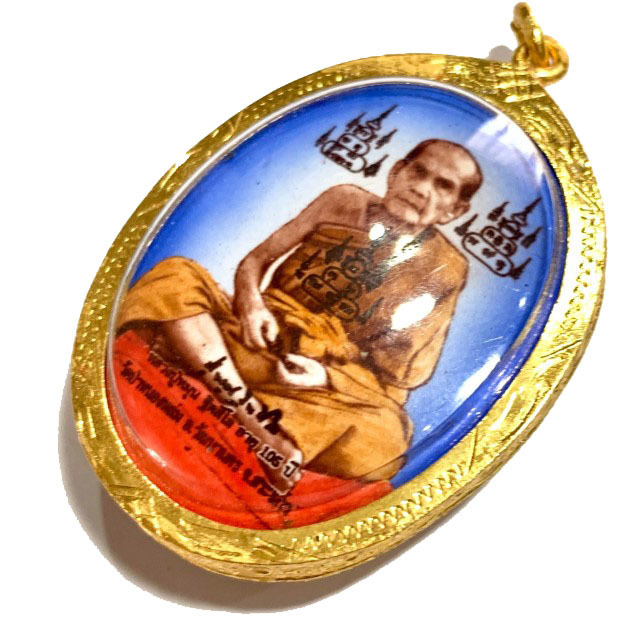 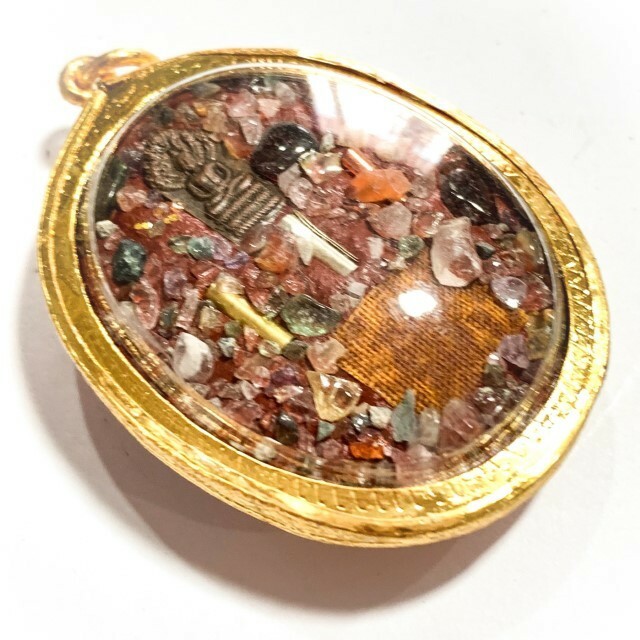 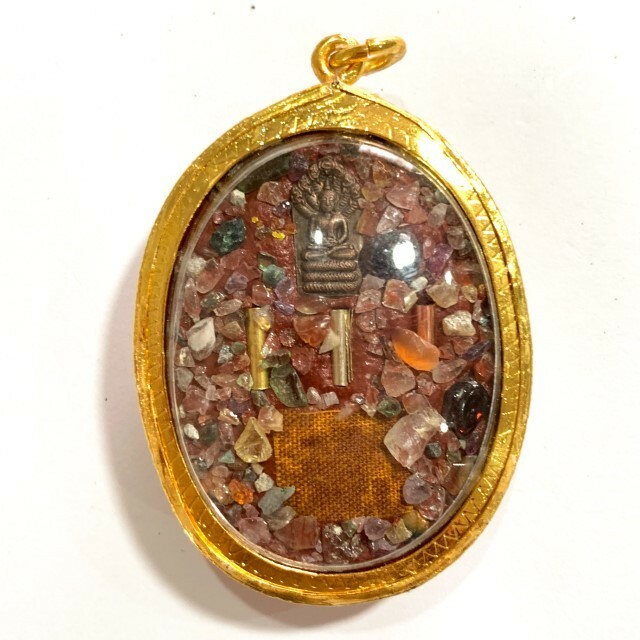 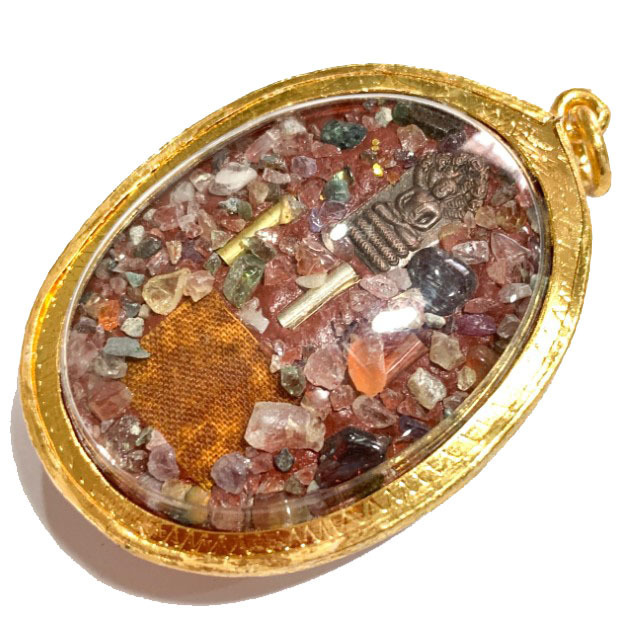 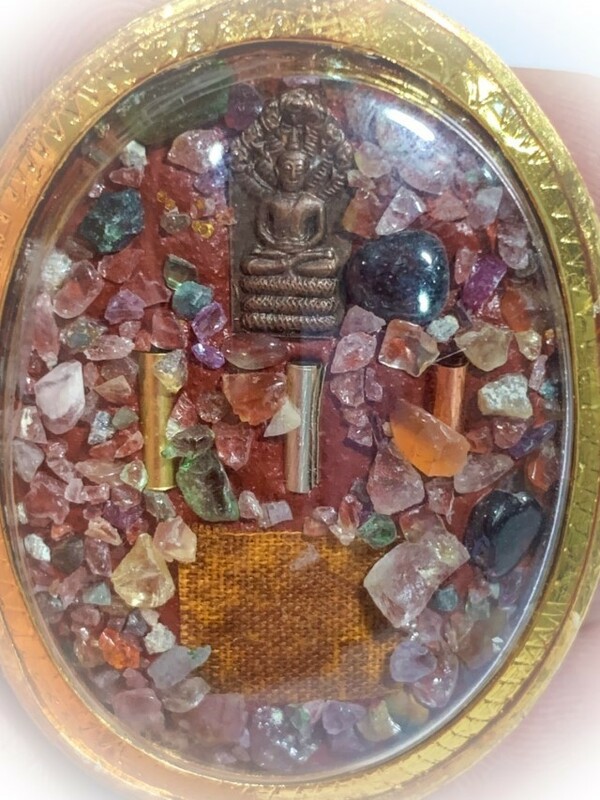 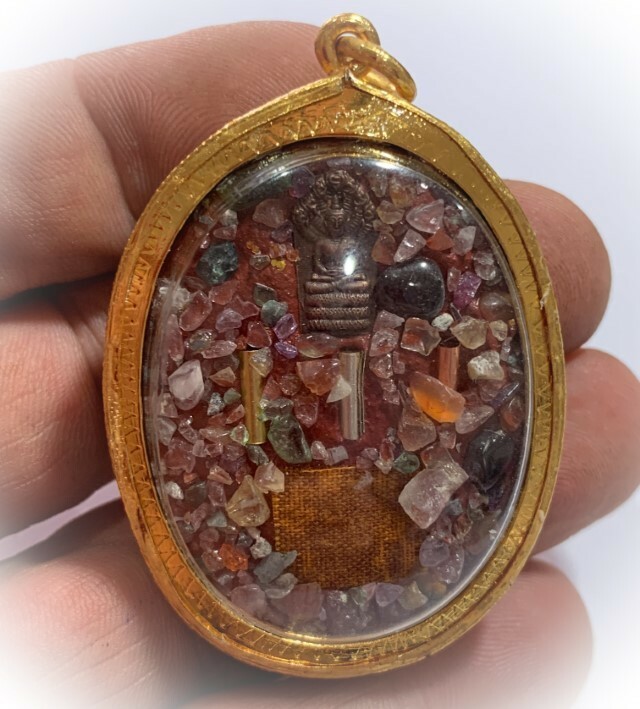 Lockets and images of the Gurus themselves, along with the Muan Sarn and empowerment within the amulet makes this kind of amulet also 'Gurunussati' (Mental Telepathic and Spiritual Connection and Remembrance / Mindfulness of the Guru). 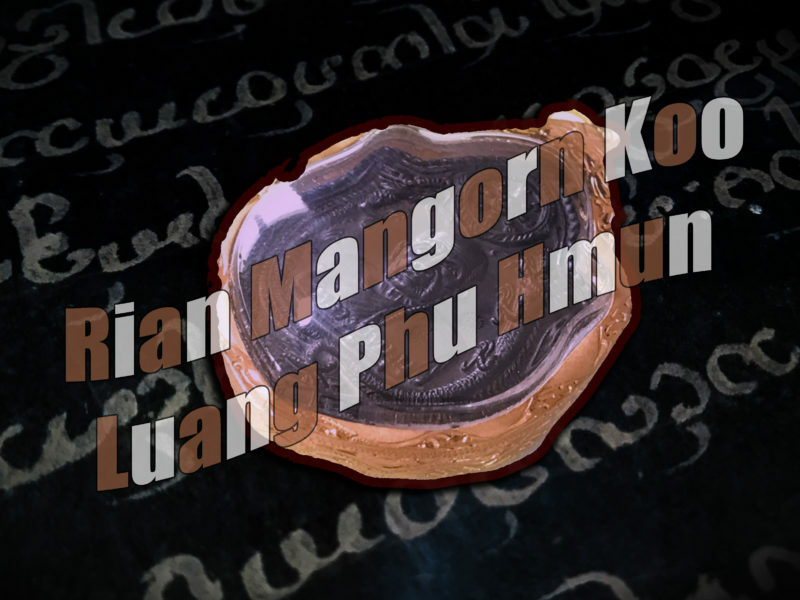 Above; the rear face has a pra Nakrpok Bai Makham Saturday Buddha inserted with Takrut Sam Kasat (3 Kings triple Takrut forming a single spell) , sacred powders, Ploi Sek Wealth attracting gemstonesReleased in the 2546 BE 'Roi Ha Pi' 105th birthday edition of Luang Phu Hmun iin 2546 BE. 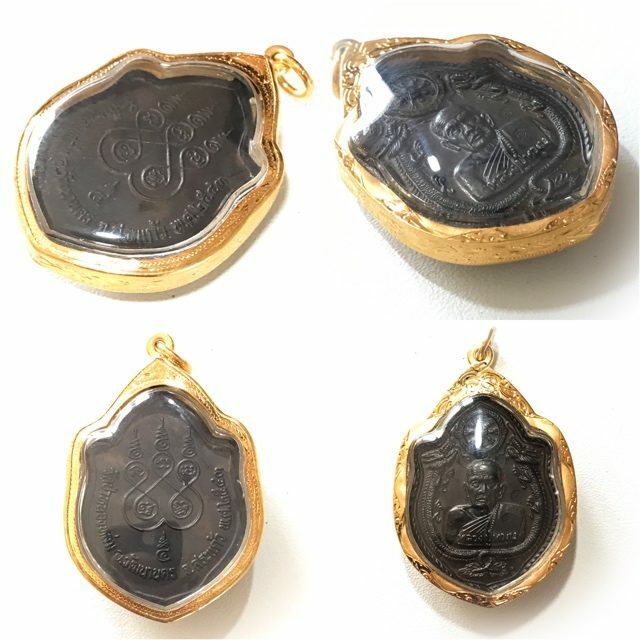 This large Jumbo size locket has a plethora of sacred muan sarn ingredients inserted into the rear face, something which our proprietor Ajarn Spencer remarked that he appreciates the overly generous and 'no holds barred ' style of compressing as much and as many powerful elements into the rear face of the locket, because this is precisely the same method he himself has used before in lockets, and sees that a true lover of powerful magick will always insert the most powerful ingredients and not try to dilute them in any fashion, except for when necessary (for various reasons which require long explanation). 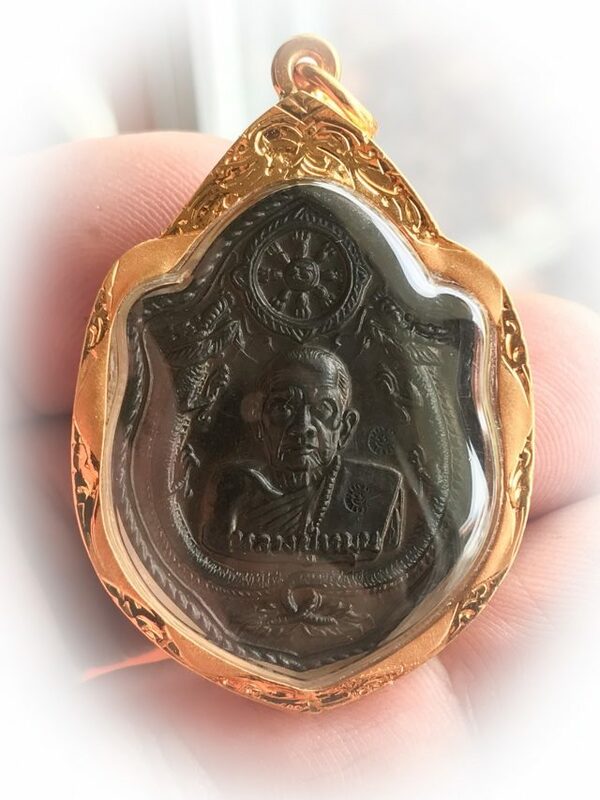 The number of accounts of people who have had miraculous experiences with amulets of LP Hmun are uncountable, which is part of what has made his pantheon such a highly regarded Master-Class status pantheon, despite being from the late 20th century, and not as old as many of the great masters who are seen as his equal.